Y'all know I'm a little bit of a sucker for those Southern boys, especially when they happen to make a ferocious racket that mixes industrial noise levels with good old scuzzy shoegaze. Or, as they like to call it, the "Outer Blues." Brian Miles is one half of the ramblin' wreck of serious sonic badassness from Nashville known to the world as Ttotals. He's the one who you'll hear performing his balancing act between clinical precision and off-the-rails madness with the guitar, and just about the same with his vocals. I've conned these dudes into coming back to DC, but more on that later. For now, Mr. Miles muses some very important pedally ponderings. 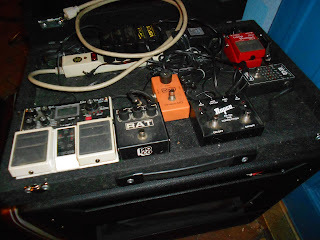 Brian Miles: Probably the ProCo Rat distortion pedal. 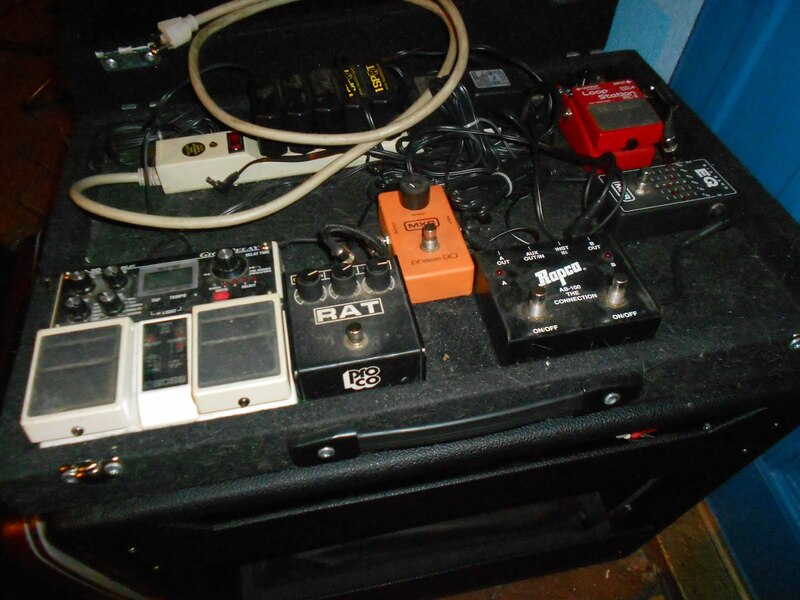 It's the simple black, square box in the middle of my pedal-board. It's one of my oldest pedals and I like it better than any other distortion I've tried or owned. Believe me I’ve tried a bunch and still have some at home in my closet of tricks. BM: C flat major. This is what my guitar is tuned to. BM: I can’t narrow it down to just one. There are several that I’ve tried to sneak things from in some way or another. They're in no particular order. I really like what Lee does in the band. He is very forward thinking and the guitar is just an extension of him and his creative mind. I love his clean tones like in “This Charming Man”. I absolutely love that song. I wish I would be open to playing more arpeggios. I can’t bring myself to play them. Sometimes simple and stripped down is just the way to go. Pete and the Spacemen had a huge impact on me. If you couldn’t tell already. What can I say that has not been said about this Rolling Stone. The Stones were never the same after Brian died. In my opinion they wrote their best songs during this time. And some of those songs impacted me more than I can describe and I am just now kind of realizing how much they actually influenced me. I highly recommend the book “Who Killed Christopher Robin”. It’s a book about Brian’s life just leading up to and during the time he was a Rolling Stone. BM: It just depends on your needs really. And what is really reliable and can take a little beating. I’m kind of rough on things, not so much now a-days, but I’ve broken a few pedals stomping on them. Sometimes you gotta be good with a soldering iron. BM: I would like to start building my own distortion pedals. I do have this crazy pedal built by Oliver Ackerman/Death By Audio. It’s called the Total Sonic Annihilation. The name describes it all. This is a crazy pedal and one I don’t use very often, but sometimes it's just called for. You’ll find it in that closet of tricks I talked about earlier.